The Cíes Islands are the Vigo estuary’s greatest treasure: an amazing national marine-terrestrial park and one of the country’s most beautiful places, which is why the Romans named them the islands of the gods. Catamaran trip to Cies islands. Monte Agudo and Rodas beach. Meet your guide outside the pier and walk nearby to board the catamaran that will take you to the Cies Island; a Paradise in front of the industrial city of Vigo. The preserve was created in 1980 and later it was made part of Atlantic Islands of Galicia National Park together with other islands of Galicia, Cortegada, Salvora and Ons. 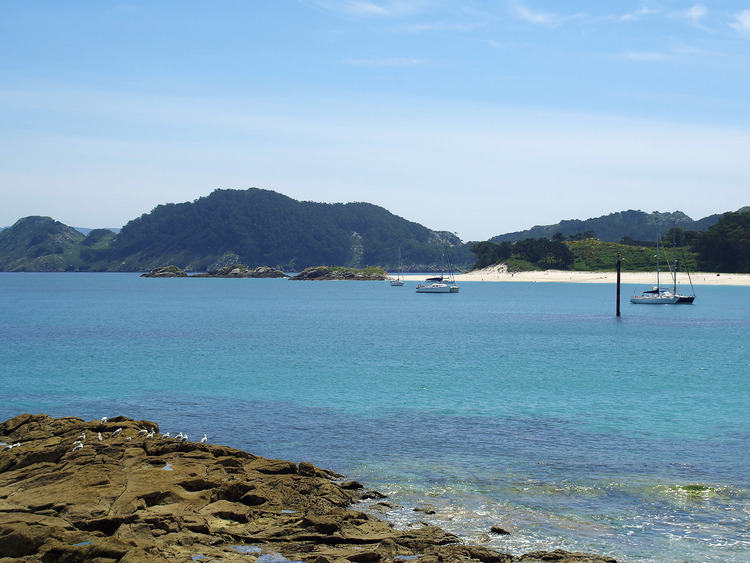 The Cies Islands is made up of three islands and offer the opportunity to discover a variety of different flora and fauna. You will arrive at the island of Monte Agudo at the Rodas beach, and here you will be impressed by the white sand beaches and the clear ocean that surrounds this island. You can choose to stay on the island on your own or join your guide for a walk to the Alto del Principe, from there you’ll be able to enjoy the views of the cliffs and the contrast between the islands.